Telling our story, one blog at a time. Judy’s on the road again, this time spending Memorial Day weekend in Sonoma, California, at Tiddle E Winks, one of those stores we’d love to get on the road and see ourselves. They did such a great job of advertising her – we’re just going to show you their ad and e-mail blast. They renamed Judy – she’s Mille the Mannequin this weekend. Doesn’t this look like great fun for Judy? We have a link to Tiddle E Winks on the blog in the right-hand toolbar. 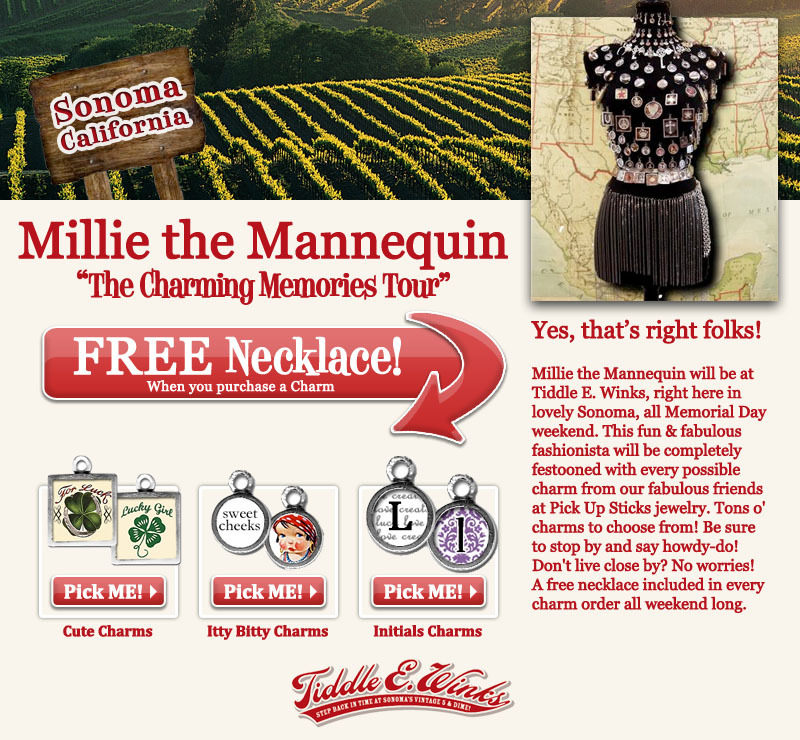 Or go to www.tiddleewinks.com for more info. 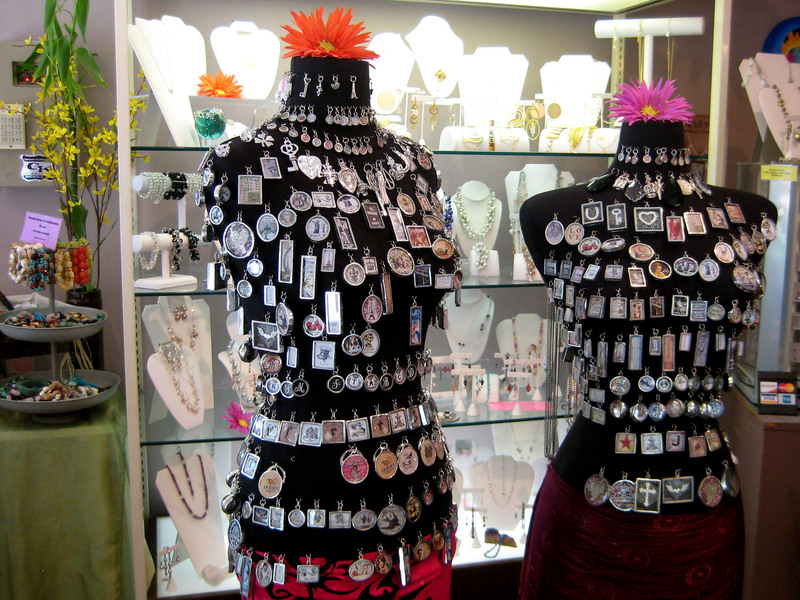 Once upon a time, we had an extraordinary retailer who ordered piles of jewelry from us. It seemed like every time we turned around, Heavenly Hostess had another order on our fax machine – the jewelry seemed to be FLYING out of her store. Dying of curiosity, we gave Cynthia at Heavenly Hostess call and asked how she was displaying Pick Up Sticks Jewelry and what prompted her high sales figures. 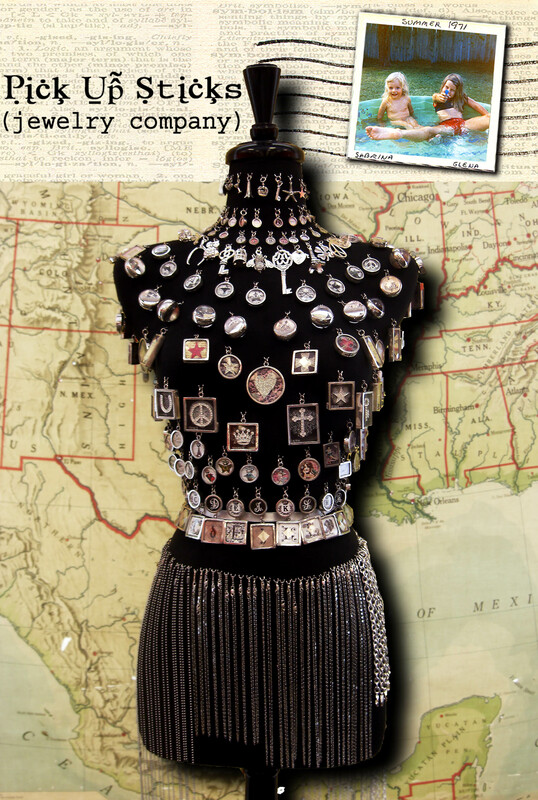 Cynthia sent us beautiful photographs, and here’s what we found – she was displaying our charms and chains pinned to a bust form that she called Judy. Judy stood next to their cash register, allowing customers the chance to touch and turn over all the charms while they waited for their ticket to be rung up. Judy’s success in persuading buyers to impulse purchase Pick Up Sticks Jewelry was phenomenal. Thus our Judy was born! With Heavenly Hostess’ blessing, we immediately began promoting Judy as a sales tool at all our wholesale shows, and more and more retailers loved the idea. She was a sales genius! Of course, everyone has their own name for Judy. One retailer named her after their favorite customer. One named her after an owner’s mother. We’ve found that whatever you choose to call her, this girl knows how to sell Pick Up Sticks jewelry. We can even provide you with the web address for ordering your own Judy. And now Judy has gone on the road! We created a trunk show and are offering our exclusive retailers the chance to have her at their store for a short visit. If you’re an exclusive Pick Up Sticks retailer and you’d like to have a traveling Judy trunk show, send us an e-mail. We’d love to send Judy to see you! This week our Judy is off to Pennsylvania, spending the weekend at Studio M, 133 Division Street in Kingston. We’ve posted a couple of photos – the girl in the skirt is the traveling Judy, and her companion is Studio M’s original Judy. Studio M is selling charms right off the traveling Judy today and tomorrow, April 30 and 31st. If you’re a fan of Pick Up Sticks and you want to see our entire line, drop by and say hello to our traveling Judy. After this weekend, she’ll be in Reno, Nevada May 7th to May 9th at Paper Moon, 550 W. Plumb Lane, Suite E1, and then she’ll be traveling to Sonoma, California, where she’ll hang out at Tiddle E Winks at 115 East Napa Street from May 28th to May 30th. Be sure to watch for traveling Judy in your neighborhood. Say hello to her for us. Judy’s far from home, but as gorgeous and gracious as ever. No telling where she’ll show up next! Don't Miss a Thing - Subscribe by e-mail! What People Are Saying about Pick Up Sticks! Language Arts – One of our collaborators. Great photos, great charms! Posts worth a second look! Pick Up Sticks Jewelry Company, 2010. Unauthorized use and/or duplication of this material or any images contained herein without express and written permission from this blog's author and/or owner is strictly prohibited. Excerpts and links may be used, provided that full and clear credit is given to Pick Up Sticks with appropriate and specific direction to the original content. An infringement of this notice will result in filing a Digital Millennium Copyright Act claim.